The town board lifted restrictions on the Yaphank project that had been in place since 2015. Caithness Long Island must still get other town approvals and state permits before the 600-megawatt plant can be built. 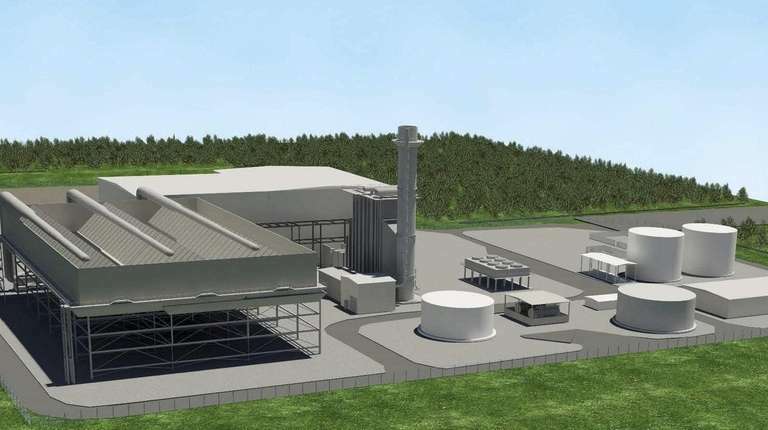 Artist's rendering of the proposed Caithness II gas-fired power plant, which would be built next to the existing Caithness plant in Yaphank. Photo Credit: TRC Environmental Corp. Critics have questioned whether a new energy plant is needed and have said the Caithness facility would harm Long Island's air and water quality. After the town board vote, civic activist Jeff Kagan told board members, "I think you need to review your environmental badges." The town board in 2014 had granted a special permit for Caithness to build a 750-megawatt version of Caithness II. The following year, the board added the covenant restricting the types of equipment the plant could use. Caithness officials this year asked Brookhaven officials to modify the covenant to allow the use of turbines that they said would be more efficient than older equipment approved in 2015. Instead of modifying the covenant, the town board voted to rescind it, saying the restrictions were unnecessary in the first place. "We're going to leave the planning to the planning board," she said in an interview. Councilwoman Valerie Cartright, who abstained from the vote, said the town board had failed to act on Caithness' request to change the covenant. "The resolution should either be approval or denial, and not repealing the restrictive covenant," she said. She said she believed the special permit approved in July 2014 had "effectively expired" this month because the plant had not been built. Eaderesto said town officials were reviewing whether the permit had expired.